A fantastic value Christmas gift idea that includes a FREE Ecoya Vanilla Bean candle worth $19.95 for all orders placed by 14th December! 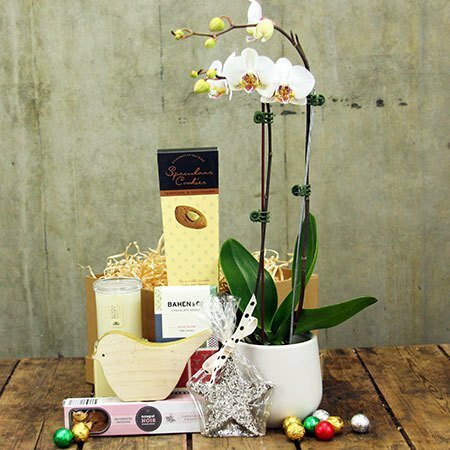 Our `Sweet As Christmas` hamper features an exquisite fresh Phalaenopsis orchid plant in a ceramic pot to beautify the home or office. Plus as an extra sweetener we have included a delectable bar of Bahen & Co 70% cacao fair trade chocolate made in the Margaret River; traditional European speculaas biscuits; a simply divine chocolate star by boutique Yarra Valley chocolate maker Kennedy & Wilson; and delicous cranberry, dark chocolate and almond nougat. Stylishly gift wrapped with festive ribbon and decorated with a carved timber ornamental bird, this Xmas hamper sure is the sweetest gift in town! 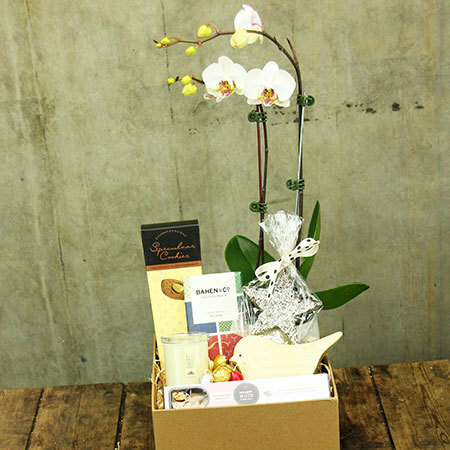 Place your order now for your Xmas hampers online or give the Flowers Elves a call on 1800 66 66 46.